Inside the realm of base running, stealing third base is thought by many to be somewhat easier than stealing second. Middle infielders are unable to work the runner as diligently as the first baseman holding the runner does. Catcher's have to work around a right handed batter when they throw. Pitchers may feel the runners are less likely to steal since the catcher has a shorter throw. Pitchers pay less attention to the runner as they intensley focus on the hitter, who's base hit can score the base runner from second. A pattern from the pitcher with the number of times he looks at the runner on second. Pitchers who always look the same number of times make it easy to time out. Say the pitcher has consistently looked twice at every runner at second. As a runner you want to go as soon as he starts to turn his head back towards home plate to throw, after that second look. Will the pitcher make me stop, or can I just keep moving, then run. If the pitcher won't pay enough attention to you to make you stop moving toward third, just keep going. Does the pitcher have a high leg kick with a runner on second, rather than use a slide step? Another opportunity to get a great jump! Middle infielders play deep and make minimal attempts to control runner leads. Both the runner and the third base coach should notice this and have a verbal sign to steal. 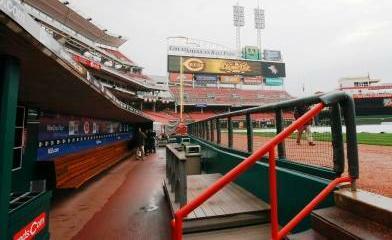 In the age of the aluminum bats, stealing bases sometimes is seen as less important. More coaches have taken to an offensive philosophy of station to station baseball, setting back and counting on the big inning to get their runs. Attempting to steal and successfully stealing puts a great deal of pressure on the defense. Pressure ultimately leads to defensive mistakes, which become offensive gains. There are 25 ways a runner can score from third base; but not from second base. Those 25 opportunities occur with varying frequencies, but one thing is certain; none of them have the opportunity to happen until that base runner is standing on third base. The first part of our offensive philosophy is to get a runner to third base with less than two outs. Stealing third base is one weapon within that philosophy. 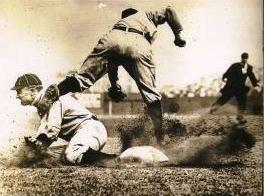 Ty Cobb stole 892 bases in his 27 year, Major League career. Cobbs' phyilosophy was, "A defensive play was at least 5 times as difficult to make as an offensive play. The potential was there for an unassisted fielder's error, a bad throw, a misplay from a bad hop of the ball, the shielding of the ball by the runner, and a mix up of responsibility between two infielders or two outfielders. On offense you had fewer ways to fail after putting the ball in play. Therefore: attack, with confidence that the odds are with you. Attack, attack - always attack." What gravy is to Thanksgiving, the running game is to baseball. A full out sprint towards first base; REMEMBER, HUSTLE NEVER HAS A BAD DAY. Look immediately to the person giving the signs. The runner needs to think "Coach ~ Base ~ Coach", for his reads. The base runners first and foremost responsibility is to keep track of the baseball. For the base runner, this is the exception in leadoffs, as you lead off in foul territory. As you step out into your lead, all these feelings intensify as you lock in on that one movement the pitcher is about to make, a movement that will send you speeding towards second base. 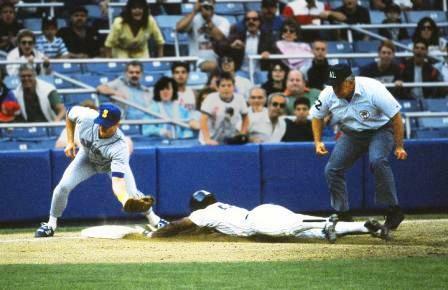 It is often easier to steal third base, than second. Here you are using the element of surprise, a great equalizer. Plays designed to amp up your running game, catching your opponent off guard while creating pressure on the defense. These 25 ways to score from third base are one reason teams work so hard at getting a runner to third base.